Antenna Theater is an award-winning, non-profit arts organization which creates original work across many disciplines. ​The name Antenna was chosen because we were not only interested in creating theater but finding a way to have an active collaboration with our audience- thus Antenna, which I took to mean; To Receive information (like an antenna does), To Transform it, and then To Transmit it back. Vacuum was the first show Antenna ever produced and for Vacuum we interviewed a multitude of vacuum cleaner salesmen and housewives and then cut their voices into the tape we used for the performance- they became co-collaborators. Holy Mackerel I was so excited!! Antenna Theater of Sausalito, California is a non-profit arts organization which creates original work in many disciplines. Artistic Director Chris Hardman founded Antenna in 1980 to experiment with the essential dynamics of sound, sculpture and live performance. Since then Antenna has created over two dozen original works, has won many Bay Area Critics Circle Awards, and has toured extensively. Antenna’s work has been presented at the Smithsonian Institution (Washington DC), the Massachusetts Institute of Technology (Cambridge, Massachusetts), the Olympic Arts Festival (Los Angeles, California – 1984), the Spoleto Festival (Charleston, South Carolina), Tubingen University (Germany), the Cervantino Festival (Mexico), the American Cultural Center (Paris, France), and the Roundhouse (London, UK), among others. The Antenna experience can take the shape of a carnival, an immersive maze, a performance piece, a radio program, a guided mystery tour, a sideshow, or a giant walk-through sculpture. Antenna uses them all to put the audience member, or “audient,” into the middle of the action. Organizations that have commissioned Antenna to create work for a wide range of sites and media include: the San Francisco Performing Arts Festival, Performing Garage (New York City), the Wexner Center for the Visual Arts (Ohio), the Museum of Contemporary Art and the Mark Taper Forum (Los Angeles, California), Earth Drama Lab and Whole Earth Catalog (San Francisco, California), Bay Area Playwrights Festival (Marin, California), and KPFA Radio (Berkeley, California). In addition, Antenna has brought its unique combination of sound, image, and movement to adventurous San Francisco Bay Area audiences in the most surprising of settings: a moving bus, recycling centers, high school corridors, Army barracks, the desert playa of Burning Man, and the Pacific Ocean’s edge. 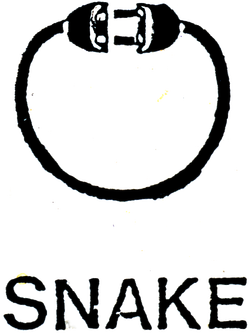 ​Snake was an experimental performing arts company which produced only original work. Founded In 1972, in Venice, California, by Co-Directors Laura Farabough and Chris Hardman, Snake created thirty-three plays and smaller theater pieces during its first five years. After relocating to Northern California, Snake toured Mexico in 1976 under the auspices of the Instituto Nacional de Bellas Artes. In 1977, Musical Director Larry Graber and Assistant Director Evie Lewis joined Snake. After 1977, all Snake productions were a collaboration of these four artistic directors. Snake created three major new works in 1978 which began the California Series: plays which explored experiences particular to West Coast life primarily performed in locations integral to their purposes. The spring play, Somewhere in the Pacific, was presented on the beach at Fort Cronkhite, Marin County. In the summer, Her Building was presented in front of Sausalito City Hall. The fall production, 24th Hour Cafe, was performed in San Francisco and then toured California, sponsored by the California Arts Council. Snake’s achievement was recognized by the Bay Area Drama Critics Circle in 1978 with an award for “New Directions In Theater.” During 1979, Snake created a major new location piece called Auto, this piece was performed at an abandoned Mohawk gas station in Sausalito. Ride Hard/Die Fast toured to several European theater festivals in Germany and Italy in early 1980. Snake’s work received national and international recognition. It received support from the National Endowment for the Arts, the San Francisco Hotel Tax Fund, the San Francisco Foundation, and the Zellerbach Family Foundation. Snake also received in-kind contributions from numerous Bay Area businesses.